The Exporta issue has all the challenges of 50 years of 19th century Postal History at a fraction of the cost! Plus you don't get dinged for multiple and colorful usages! This site will demonstrate that by focusing on the Postal History of the Exporta issue, however my goal is that it will also contain as much helpful information about the stamps as is possible. It was oringally a census of collector contributed images of covers showing interesting uses of the Mexico Exporta series, and we will continue that focus. We welcome contributions to our database. Contact Tom Droege if you would like to submit covers to the Census. It is also a site where you can find other useful material on Exporta and links to other web sites with Exporta related information and/or dealers knowledgable about Exporta. The Exporta Definitive series is a very attractive and well designed issue that highlights the products Mexico produces and exports. Mexico experienced a period of inflation during the years of the exportas (though it seems the postal rates outpaced the general inflation by a very wide margin), and so postal rates changed 21 (T29-T50) times in 25 years (1975-2000). Exporta covers are found in "dollar boxes", yet finding correctly rated covers is a challenge. Covers made up of multiples of different stamps, yield attractive, non-philatelic usages. Many single frankings are hard to find. In 25 years, Mexico sent mail to all the continents, yet try finding covers to Africa or Asia. For those florescently minded, there are the "14 Paper Types", with differing reactions to black light. Burelage is a security measure that was printed on many of the higher values, and sometimes it was printed upside down -- making for several inverts! 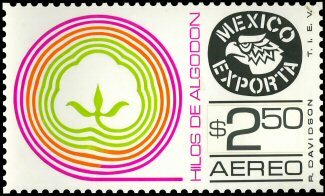 The rarest Exportas, known as the "Bionicas", resulted when the stamps were printed on the wrong side of the phosphorescent coated paper. They are known as the Bionic Bull (only one on cover known) and the Bionic Bicyle (roughly a dozen known). The Bionic Bicycle sells for $1000++ on cover. The Bionic Bull has not been offered publically. I am always buying Exportas, especially if they are not to the US. Mike Rhode's Exporta Exhibit from Sydney 2011 frame by frame. Frame 1, Frame 2, Frame 3, Frame 4, Frame 5. Airmail, Surface, Registered, Registered with Restricted Delivery, AR, Special Delivery, Printed Matter, Postage Due, City, Border, Domestic uses. Postal rates start with rates by units of 20 grams, later tables are used <20, <50, <100 etc. Early uses of denominations, 1st and last days of rates. Post Card rates, small package rates. Early Usages by Denomination (5c to 9p), (10p to 90p), (100p to 1900p), (2000p to 7200p), First, Second, Last Days of Tariffs. When you find a cover that interests you, use the "like" link and find out if it was one of the Best Liked Covers. Join the Exportas Yahoo Group by sending an email to "exportas-subscribe@yahoogroups.com" with the subject "Subscribe". The group is for collectors, dealers, and buyers of the modern Mexico issues, mostly Exportas, but also A&A, Tourista and Conserva. It is a place were anyone can post questions to the group, announcements, items for sale, etc... relating to Exporta or other modern Mexico. Send an email to this address to join the group. It is different from a bulletin board or forum, in that when you email a message to the group, everyone in the group will get the email, and you can start a conversation immediately. Post a Message to Exportas. Subscribe to Exportas. Unsubscribe to Exportas. Click here to send a email to Tom Droege or call 919-403-9459 and ask for Tom Droege. The Department of Who is Doing Related Work Let me know if you want to be included in this list. Starting in August, 2014, Rafael Davidson's (Exporta designer) original art work was offered by LA FILATELIA MEXICANA. The PDF's of the Catalogs with the Exporta related material are here. Part 1, Part 1a, Part 1b, Part 1c. Part 2. I assume that parts 2 and 3 will be offered later. The online catalog can be found at: LA FILATELIA MEXICANA. Even the designs that never became stamps are striking, and so are included here. More complete information can be found in the PDFs. DesignBoom Web Page of Exporta Stamps by Rafael Davidson at MUFI. All the Images from this site in a single 500 MByte Zip file..
Etiangui Classification Guide (in Spanish). All Rates, North America (US/Canada) Rates with Calculator, Europe Rates with Calculator, with more to come later. If you do not want to sign up with StampAuctionNetwork, you can login with the guest account (user name = Guest, Password = Exporta), but you won't be able to keep track of your own "liked" covers. Scarcest Exporta Denominations on Cover, Covers I like, Best Liked Covers. Finding correctly rated covers in good condition is a challenge. Here are some ideas on how to get started. Try finding 1x rates, 2x rates, and some registered or AR covers. Look for covers from different destinations. North America is easy, and Europe not so hard, but after that it gets tough. Some of the issues are very hard to find. Finding a 5c on a correctly rated cover is very hard. Same with the high values. Covers with just a single stamp paying the rate are also hard, except when it is a very common rate, like 1.6 to the US. But there are a number of combinations that work. In Order to see the covers in the Exporta Cover Network, you must be logged in at StampAuctionNetwork.